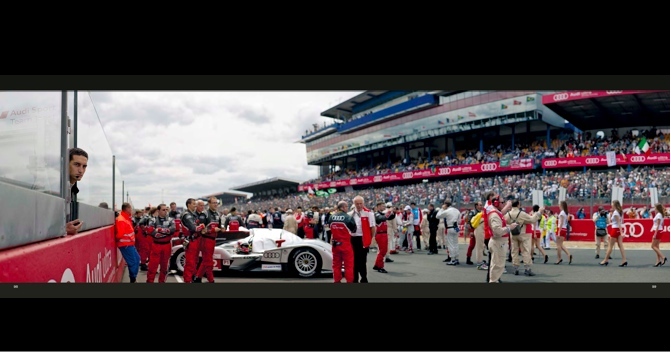 (English and French) Whether you’ve attend Le Mans in body—as one of the 250000+ spectators—or in spirit—as one of the over 5 million TV or Internet followers—you won’t have seen half the things award-winning photographer Gavin Ireland offers for your delectation here in grand panoramic photos. And even if you had an All Access pass or friends in high places that open otherwise closed doors, you’d have to do an awful lot of pavement-pounding to cover as much turf and be in as many places as Ireland will take you to—all from the comfort of your favorite armchair. As he rightly points out, the Le Mans 24 Hours are a test of endurance for everyone. Much like a Barrett-Jackson auction is not merely an auction but a veritable circus and “lifestyle” event, so is this one week every June that culminates in what is commonly known as the Grand Prix of Endurance and Efficiency. The exact number of miles that can be covered in a 24-hour span obviously varies and it just so happens that in the first of the two years Ireland covers here, 2010, a new distance record of 5,410 km (3,360 mi) was set. To put this in perspective: more than six Indy 500s or about 18 times longer than an F1 race. Now consider that in 2011 the winning cars crossed the finish line less than 14 seconds apart after 24 hours of racing and you can appreciate that this sort of racing has unique challenges. Ireland is self-taught and his first Le Mans assignment, in 2002, was probably his first proper motorsports job. This is also the year that Renault UK and the Motor Sports Association (MSA) launched an award for the most promising British motorsport journalists and photographers aged 25 or under. 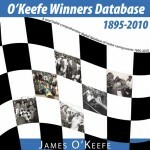 Ireland won their Photographer of the Year award in 2005, partly for his Le Mans work where he has shot four times since. You may recognize his name from two other books about racing tracks, Autodrome and Speedway, both of which deal with abandoned ghost tracks. Conceptually, those photos have a totally different story-telling slant but it is that same eye for the essence of a thing that informs his work in this newest book. 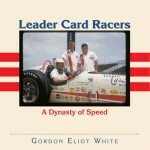 Books about racing stats and track layouts and history and reams of minutia have their place, an important place. This book has nothing of the sort and takes a completely different tack. It covers only two years, 2010 and 2011, and concentrates on the two dominant teams, Audi (R15 and 18) and Peugeot (908). Except for a two-page Introduction there is minimal text—it’s all about the photos. Cleverly, in a nod to the host country, the text is in both English and French (a French-market version was published by ETAI under its own ISBN, 978-2-7268-9617-4). The idea here is to give the reader the impression of actually being there, day by day and through the various phases of the race. Imagine you’re going for the first time and Ireland is your tour guide. 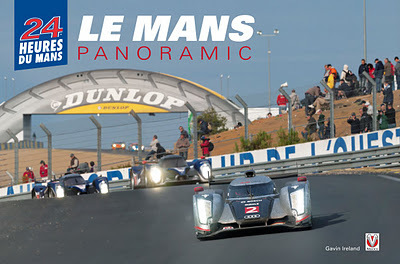 From entering the city of Le Mans to walking its cobblestoned streets; a first look at key features of the track, making the city streets and country roads race-ready, the scrutineering of the cars, testing and quali; then the evening/night/morning stints of the race proper and, lastly, the aftermath, breaking down the tents and saying au revoir, Ireland gives you a taste of what it’s like to really be there. If you were there, you wouldn’t necessarily have seen what Ireland saw and you certainly wouldn’t have seen it the way he did—recall the earlier comment re. the essence of things. Even though Le Mans is uncommonly open in allowing the public access to normally sequestered activities like scrutineering, which happens with much hoopla right downtown on the Place des Jacobins, Ireland captures it in unusual ways. Shots of the crowd, into the crowd, a flatbed with a racecar on its deck ambling through narrow empty streets, all with a beautiful sense for the totality of a scene and its dynamics. Attention to detail is evident everywhere, and sometimes sheer luck or even altogether unplanned niceties that will reward the attentive viewer. Take, for example, the double-page photo (p. 202) of a busy pit stop bursting with activity. Look into the car’s fender mirror—and puzzle out what it reflects. Surely Ireland couldn’t have known to plant himself just so and press the shutter at just that millisecond to get this image. In most of these photos, even the ones that are not a full double-page spread, there’s so much going on that you’ll want to take your time to move the old eyeballs around and look at everything, here and there and everywhere—and maybe even have a loupe handy. Each of the 16 sections is introduced by about half a page of text. You’ll want to read that since none of the photos have captions and this intro text does mention names, cars, places etc. the following photos depict. Photos of other marques, teams, and people than the two main protagonists flesh out the story. The absence of in-depth narrative means, of course, that none of the great secrets of the universe are unraveled, be that why the Jett Girls have purple hair (p. 94) or how the Index of Performance works. Time for Independent Study. . . . Like matryoshkas (the Russian nesting doll) there are stories within stories within stories here. Take the iconic vintage Routemaster doubledecker bus (p. 82). Plenty cool all by itself. Notice it is operated by “Go Ahead”? Go-Ahead Group is one of the UK’s leading providers of passenger transport and just now (March 2012) partnered with Williams Hybrid Power (part of Williams GP Engineering) to develop—F1 readers, listen up—a flywheel energy storage application for use in buses. And a different version of that very WHP technology will be on the Audi R18 e-tron Quattro at the 2012 24 Hours. So, keep that brainbox churning while you’re delving into the photos! In every aspect, a truly fun book. Dans chaque aspect, un véritablement fun book.